Leave Your Swimming Pool Hassles To Us! When it comes to positive additions to your property, you can’t get any better than a swimming pool. Swimming is a fantastic form of exercise and having a pool right outside in your yard means that you can cut out on travel time to a local facility and instead just dive right in. It also provides a great source of entertainment and fun for everyone in your family, irrespective of their age. Nevertheless, to keep your pool in top condition takes a great deal of time and effort. Many people simply don’t have the time it takes to maintain their pool effectively and badly cared for pools can be a health risk as well as looking unsightly. What if we could tell you that you don’t need to give up your precious time off to care for your pool. When you hire a professional pool service company, you can rest assured that your favorite home feature is in safe hands. We have more than 25 years of experience in swimming pool service and can undertake every aspect of their maintenance. In doing so, we can save you time and effort and help ensure that your pool is a safe, fun amenity that you and your family can enjoy. Getting the right balance of chemicals in your pool is absolutely essential for both safety and cosmetic reasons. This involves monitoring and balancing pH levels, alkalinity and stabilizer. 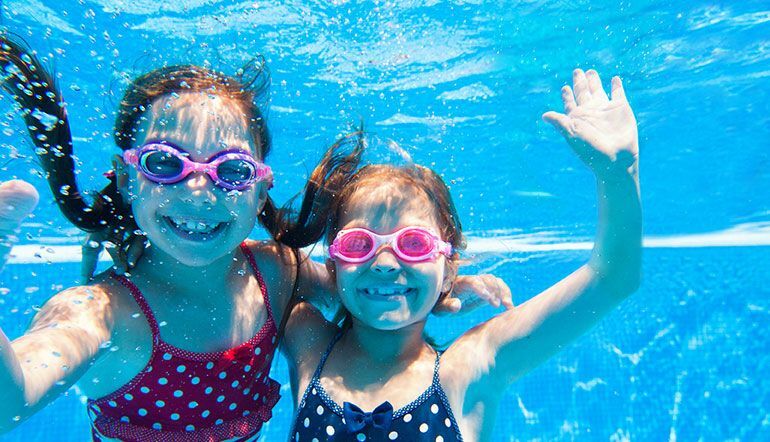 If you have a salt-based pool producing chlorine or a chlorine-based tablet pool, your pH levels need to be correct otherwise the chlorine sanitizer won’t be functioning at optimal strength killing germs and bacteria. The balance must also be correct so that the water doesn’t adversely affect your skin or eyes. In terms of the function of your pool, not only does professional chemical balancing help keep the water sparkling clean and inviting and protect your pool finish from damage, but it can also protect your pump, heater and other components of the system from becoming corroded and ineffective. Cleaning these out regularly will help ensure that your pool systems are operating effectively and efficiently and can prevent damage from occurring due to clogging. Our cleaning service includes pool sweep bags, pool skimmer baskets and pump baskets. Unsurprisingly, the filter is one of the most important parts of any swimming pool and your pool will only remain as clean as your filter is. Sand and D.E filters are highly effective at keeping your pool clean, but in order to keep them that way, they need to be backwashed occasionally. This is because pool filters are a lot like sink strainers. Over time, bits of debris can get stuck along the bottom of them and the only way to get them out is to flip the strainer over and run water back through from the opposite direction. Backwashing a pool filter uses the same technique, combined with sand or diatomaceous earth (D.E) to filter out even the smallest particles. The process can be complex and time-consuming, which is why so many pool owners opt to bring in professionals like us to undertake this fairly arduous task on their behalf! As you might expect with an outside pool, debris collecting on the surface is a common problem and can make swimming unpleasant. Common things found on the top of the pool include leaves, branches, dead insects and garbage that may have blown into your yard. However, it isn’t unheard of from debris to affect indoor pools too. We can remove anything from your pool that shouldn’t be there, making it clean and ready to enjoy once more. 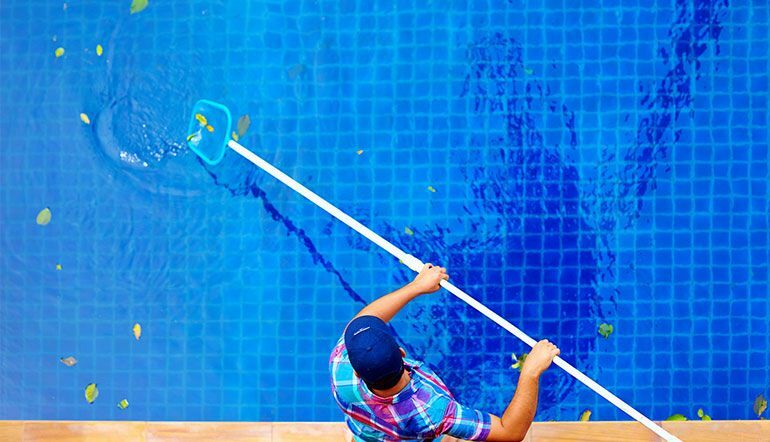 Obviously, you will want your pool to be as clean as possible. Unfortunately, sanitizer alone isn’t enough to prevent algae from invading your pool and making it slippery and unsightly. We can clean away algae from walls, steps and the bottom of your pool before it grows out of control. This can save you time and considerable amounts of money as once algae has taken over your pool, it can be tricky to get rid of. We can also vacuum leaves and other debris from the bottom of your pool, leaving it in the best possible condition. If your pool water level has dropped below normal, you will want to see it raised back up to optimum height. However, this is much more complicated than just adding more water. The process involves cleaning the pool and evaluating and adjusting the pH levels and chlorine to the achieve the right balance, which as we know, helps ensure that your pool is both safe and functioning properly. If you would like to learn more about any of the services that we can offer, or if you would like to book a pool maintenance visit, please don’t hesitate to contact us. We offer pool maintenance services to customers in Fort Worth, Arlington, DFW Metroplex, DFW Mid Cities and the surrounding areas.